Per user request, here goes 64-bit version of NTFS Links utility, which provides shell UI for NTFS Junction Points. As 64-bit version of Windows operating systems provide two versions of shell explorer, and support both Win32 and x64 platform applications, it is typical to install both 32-bit and 64-bit versions of the utility to cover/extend applications of both platforms. Note that 32-bit (Win32) applications can only load and directly interact with 32-bit builds of libraries (DLLs), so 64-bit (x64) applications need a corresponding matching version of the shell extension available. 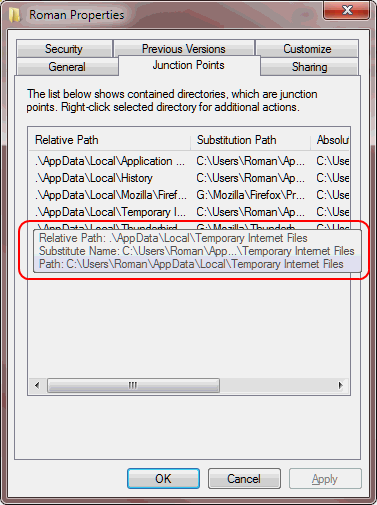 As the utility provides a shell extension for directory property pages, here comes a curiosity exercise: how Windows 7 uses junction points to cross-map directories under user profile directory, e.g. C:\Users\<username>\Local Settings directory is actually a shortcut to C:\Users\<username>\AppData\Local.